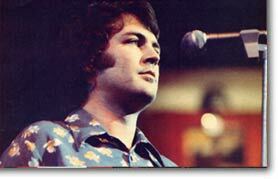 Ian Gillan remained pretty much out of the public eye for two years following his departure from Deep Purple. In that time he involved himseff in a number of business interests, including motorcycle engines, a country hotel / restaurant (with a guitar shaped swimming pool), and ownership of the Kingsway Recorders studio, where from April 1974 he began to work on his first post-Deep Purple solo tracks. Aided by session players Mike Moran (keyboards), Dave Wintour (bass), Bernie Holland (guitar) and Andy Steele (drums), Ian recorded a diverse set of tracks which failed to find favour with Deep Purple's old management team, who suggested he pursue a more rock oriented approach. A spur for Ian to throw himself back into full-time recording and touring was provided by an emotional appearance at Roger Glover's 'Butterfly Ball' live show at the Albert Hall on October 16th 1975, his first stage appearance in over two years. Ian gathered together a recording band consisting of Mike Moran, John Gustafson (who'd been working with Roxy Music - Eddie Jobson was also asked to join but got a better offer from Frank Zappa), and Ray Fenwick (from Fancy), who had all originally played on the Butterfly Ball project, and ex-Elf percussionist Mark Nauseef. 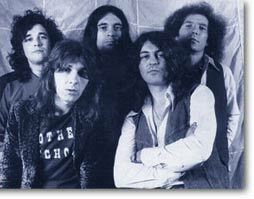 The new band was named Shand Grenade for a short time, before the more commercial Ian Gillan Band was settled upon. Roger Glover both produced and played on synthesiser on what became the album 'Child In Time', centred around a reworked version of the Mk2 classic (he also played bass on a promotional TV appearance in early 1976, a mime to 'You Make Me Feel So Good', the only track carried forward from Ian's 1974 sessions). Recorded at Musicland in Dec 75 / Jan 76, and Montreux in Feb 76, 'Child In Time' eventually reached a modest #55 in the UK album charts in July 1976. With the band about to go on the road, Moran bowed out to replaced by ex-Elf & Rainbow keyboard player Mickey Lee Soule. The band's debut tour was in France, where Ian was now based for tax reasons (and why the album was not recorded in Britain). The shows began in Toulouse on April 14th. With a US support tour with Nazareth imminent, Lee Soule was replaced by Colin Towns. The band's music quickly evolved into a form of complex jazz rock, driven by Fenwick's guitar style and the percussion work. Their next album was 'Clear Air Turbulence', recorded in 1976, but delayed until April 1977 following a thorough remix. It failed to chart in the UK. Although containing some excellent music, it was dropped into a UK music scene caught up in punk and new wave, and IGB's music simply did not fit. The accompanying tour also caused some confusion among Purple fans, who were unsure how to take jazzy versions of 'Smoke On The Water' and 'Woman From Tokyo'. It was music aimed more at musicians than audiences. The slightly rockier and more accessable 'Scarabus' album arrived later in 1977 and, following a hugely successful Japanese tour in October 1977, two live albums recorded at the Tokyo Budokan were released in 1977-78. However, after a tour of the UK college and club circuit in May 1978, Ian decided to bring the band to a halt. He then began to put together a new one with Colin Towns; inspired by a song called 'Fighting Man' which Towns had written specifically for him. When Ian next played the UK, in August 1978, he was to do so with a band which played hard rock with at least as much aggression and imagination as any other contemporary ac. Originally released on Island label. Remastered on CD, no bonus tracks. Originally on Island label. Remastered on CD, no bonus tracks. Five tracks from Tokyo, Sept 22nd 1977. Originally a Japan only release. Reissued along with Vol.2 on CD. More tracks from Tokyo, Sept 22nd 1977. Originally a Japan only release. Reissued along with Vol.2 on CD. The two Live At The Budokan albums were reissued together on a double vinyl set by Virgin in 1983. A pressing error lead to the'Smoke On The Water' being included twice and 'My Baby Loves Me' being left off. From Ian Gillan's personal archive. 18 eclectic tracks recorded between 1972 and 1974. Reissued in November 2009. The Ian Gillan Band live at the Rainbow Theatre, London in May 1977. 30 minutes long. Released on DVD by Angel Air, but in VHS quality. Since the late 1990s the UK-based Angel Air label have released a number of Ian Gillan Band / Gillan live and studio out-take CDs plus one DVD. They are usually of dubious merit, and none have been authorised by Ian, who has described the releases as "very doubtful and totally unapproved. Don't waste your money." CDs : Rarities 1975-77: Studio Out-takes  The Rockfield Remixes Plus: The Original Mix of Clear Air Turbulence, plus live tracks.  Live At The Rainbow: From VHS video soundtrack, with new guitar overdubs by Ray Fenwick.  Live Yubin Chokin Hall, Hiroshima 1977: Soundboard recording. Incomplete show. • DVD : Live At The Rainbow 1977: From VHS source, poor quality. The bonus tracks are audio only, apart from a new interview with Ray Fenwick.